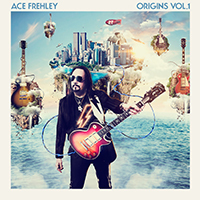 Frehley, Ace - Origins Vol 1. As a follow up to the generally well-received "Space Invader", Rock and Roll Hall of Famer and former Kiss guitarist Ace Frehley opted on releasing a covers album. And it’s a rollercoaster ride spiced up with an all-star cast. Idiosyncratic? You bet. Self-indulgent? Well, perhaps to a certain extent. Frehley is actually surprisingly self-disciplined when it comes to laying down the set. And while the influences tumble out in seemingly random fashion he keeps a grip on each track. Understandably the album bags a strong Kiss reference, with “Rock N’ Roll Hell”, “Cold Gin” and “Parasite” assuring an exciting enough throwback to Frehley’s face-painting days, plus old mate Paul Stanley drops in for what turns out to be a rather forgettable take on “Fire and Water”. That backfire aside, there are genuine moments of interest on here; “Emerald” (featuring Slash in full flight mode) is noisy and arrogant, “Spanish Castle Magic” is revamped with vigour, and appropriately clad in retro guitar twangs, “White Room” will unquestionably have you bouncing up and down your living room in underpants…again! Unavoidably, there is a lack of cohesion, and while it is not exactly an essential purchase, “Origins Vol 1.” is full of wholly individual and alluring performances.